I’m a designer/builder/strategist who helps authors solve problems and explore new ideas. The first question I'll ask you is "how will you know your website is successful?" From there, we'll work our way backward to figure out what content and features you'll need to make the site successful. With that plan in place, we can determine the right way to go about building it (WordPress? Squarespace? Something else?). A good website is not one that is built and released in one swift motion -- it's a tool that can be used and manipulated as your needs grow and change. So, it should be something you feel confident using! The final question I'll ask is "how do you want it to look?" If you have ideas, we'll run with them and see where they take us. If not, we'll figure it out together. My job as your designer will not be to bring my designs to your project, but to bring your project to life through design. I’ve provided design, strategy, and development for over 15 years, serving clients and industries across the board, including entertainment, real estate, healthcare, the arts, non-profit, and education. I’m honored to have built long-standing relationships with my clients, serving most for many years. As a “full stack designer,” I have experience with all aspects of web design: marketing strategy, copywriting, UI/UX design, and front-end development. I never “farm out” work or use stock templates. I live in Milwaukee. When I’m not working, I’m taking care of my two sons, chipping away at writing children’s books, and training for running races. I’ve provided design, strategy, and development for over 15 years, serving clients and industries across the board, including entertainment, real estate, healthcare, the arts, non-profit, and education. As a “full stack designer,” I have experience with all aspects of web design: marketing strategy, copywriting, UI/UX design, and front-end development. I typically work with WordPress or static websites, but will support others including Squarespace as needed. Vain Magazine was a Seattle-based art magazine that featured short fiction, poetry, fine art, and music created by independent creatives. I led the art selection process, design, layout and printing efforts for eleven issues. Davy Rothbart's "My Heart is an Idiot"
Davy Rothbart is the creator of Found Magazine and a frequent contributor to public radio’s This American Life. His collection of short stories, "My Heart Is An Idiot," was named one of the Best Books of 2012 by NPR's Morning Edition, Amazon.com, Vanity Fair, and The Huffington Post. I worked with Davy to produce a single-page website that allowed him to feature press about his book, tour dates, excerpts, and links to purchase the book. 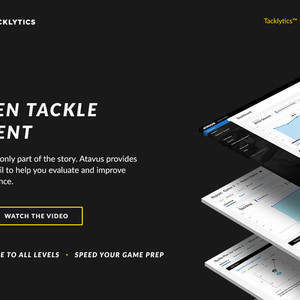 Atavus provides tackling data and training for football organizations around the US, including the Seattle Seahawks. I worked with the Atavus team to build out their product and marketing strategies. I led a complete redesign of their website, including responsive design, copywriting, art and photo direction. Katie Arnoldi is the author of national bestseller "Chemical Pink," Los Angeles Times bestseller "The Wentworths," and most recently "Point Dume" a novel about human trafficking, the Mexican drug cartel, and the death of surf culture. Katie's website was created to not only provide basic information about her books and tours, but to be an extension of the worlds she creates. The website features hidden symbols and iconography that reveal secrets about her characters and future projects. Zack was a total pro from start to finish. Not only was he able to work within a tight time frame, he did so with a commitment to excellence. I'm so happy with the end result...couldn't have done it without Zack! Zack is a total professional. Very helpful, fast and efficient. Great eye for detail, style and design. I will definitely work with him again in the future and I recommend him highly. It's been an honor working with you, Mike. I really appreciated your openness and humor throughout the project. Cheers to stratospheric sales! I have thoroughly enjoyed working with and learning from Zack. He is knowledgeable and versatile. I feel confident that my business will grow because of the effort Zack's creative and marketing efforts and hope to work with him again when it does. Working with Jyoti was a truly collaborative effort -- from design, content, and technical implementation, she contributed insightful instruction and feedback, while also valuing my input. The end result is a vibrant and engaging site that showcases the powerful message of your book for a global audience. Congratulations on the release! That we were able to navigate the challenges of MailChimp's and Facebook's maddening content flagging is a testament to your optimism and patience. It has been a real joy and privilege to collaborate with you, Richard. Cheers to a successful book launch! Join Reedsy to request a free quote from Zack and over 1,000 similar profiles.